It is such an honor to be your Dean of Students. I’ve spent more than half of my career helping students find success in front of employers and partnering with academic units to tailor the job search process for students of different backgrounds and majors. I’m thrilled to have the opportunity to build on those relationships and provide care holistically to the student experience. I frequently talk about having the courage to care. At UF, we frequently use the term care, but that doesn’t always mean we are caring vulnerably or with grit in the face of adversity. UF students are unique and diverse, but we can all agree that individual well-being, feeling valued, and being respected are necessary to every students’ success in college. As Dean of Students, I’m here for you to listen, to be an ally and to care courageously. This means pushing beyond boundaries when it is right and going out of my way to learn more about the what’s needed to serve you. I work with our Dean of Students Office team, as well as the Division of Student Affairs and the UF community, to evaluate where we are now and how that’s going to lead us into the future. I invite all students to share your thoughts, concerns, hopes, and ideas with me. I want students to be involved in all aspects of the University of Florida experience so that together we can build rich experiences that transcend one’s time at UF to make a difference on the global level. I would love to hear your ideas on the best way to connect with as many of you as possible. Please know that our team in the Dean of Students Office is always here for you and are willing to listen, create change, and shape UF for the better. Heather White has served as Dean of Students and Associate Vice President for Student Affairs since January 2018. In her role, she oversees the Dean of Students Office, Multicultural and Diversity Affairs, and the Counseling and Wellness Center. As the Dean of Students, she is responsible for student safety, the Division of Student Affairs emergency response, and the education of the University’s Code of Conduct. The Dean of Students Office also oversees the transition of all new students to the UF community and coordinates the U Matter, We Care initiatives including the Dean-on-Call incident response program. Dr. White also serves chairs the Crisis Response and Behavioral Threat Teams. Prior to assuming her role as Associate Vice President and Dean of Students, Heather served as the Director of UF’s Career Resource Center (now Career Connections Center) from 2011 to 2017 after serving 8+ years in a variety of roles in the center. In her role as Director of the Career Center, Heather led more than 30 full-time professionals and provided management and oversight for a centralized center serving approximately 50,000 students. Before coming to UF 15 years ago, Dr. White worked in Housing and Residence Life at Valdosta State University and Jacksonville University. Heather holds a Doctoral degree in Educational Leadership from the University of North Florida, a Master’s degree in Counselor Education from Mississippi State University and a Bachelor’s degree in Psychology from Troy University. 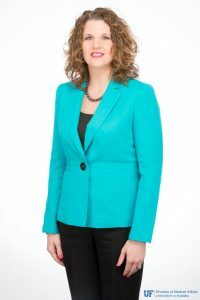 Heather is a member of several national organizations where she has held leadership roles and delivered numerous presentations at local, regional and national conferences and consulted internationally.